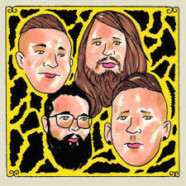 There Will Be Time is the sophomore effort from Joplin, Missouri indie quartet, Me Like Bees. Comprised of Pete Burton (guitars),Nick Bynum (bass), Luke Sheafer (lead vocals) & Tim Cote (drums). There Will Be Time is a four track EP. Every time I see that a new band releases an EP, I start to wonder why? Was it that they didn’t have enough material, funding or talent to put out a full length record. In all fairness to Me Like Bees, I can assure you that talent is not something that they’re lacking. Don’t believe me? 2015 was a pretty good year considering that they beat out over 20,000 bands to win a spot on The Vans Warped Tour along with snagging a month long opening gig for Never Shout Never! The first two tracks of There Will Be Time, Changes and Tundraland has a strong feel musically of indie darlings Arcade Fire and MGMT. Title track, There Will Be Time features vocals and an acoustic guitar that showcases the bands diversity which is an idyllic shifting of the gears. Rounding out There Will Be Time is the folk tinged, Hymns and Blues. Most bands have one song that reveals their roots. Call me crazy but Hymns and Blues seems to peel back the layers of the onion for me. All in all, There Will Be Time is a well crafted record coupled with the indie pop sensibilities, sedate vocal melodies and creativity that a band twice their age would be proud to deliver. Bottom Line: The sky is the limit for Me Like Bees.